Game companies may have decided that Americans were no longer interested in 2D games in the 32 bit era, but in Japan 2D was still alive and well. Elevator Action Returns is an excellent example of the kind of games that we missed out on due to the 3D craze. The game distills the best that the arcade original had to offer and mixes it with an equal dose of Contra to create a more engaging action experience. 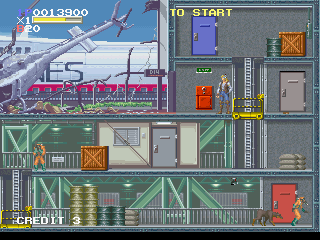 The first level is very reminiscient of the original game, as you make your way down a slender building using its elevators while ducking into red-colored doors to steal enemy files. When you get to the bottom of the building, you’re picked up by a friendly van and driven away. After that the game, while maintaining the same very basic gameplay elements, diversifies itself into a much more varied world. You still fight through buildings, getting around using elevators and going into the red doors to steal data, but instead of high-rise after high-rise, you fight through airports, train stations, and construction sites which are laid out in a much less linear fashion. New to the series are blue doors, which when entered will give you power-ups, items, or points and unlike the red doors, are not mandatory. You can now choose between three characters, each with their own strengths and weaknesses along with a unique standard weapon, and the enemies are much more varied, including zombies and guard dogs. Weapons at your disposal now include machine guns, rocket pistols, and grenades, along with the stock hand gun. Elevator Action Returns is a pretty pricey game for the Saturn and well worth it in my opinion, but the game is also included on the Taito Legends 2 disc that was released on the Xbox and Playstation 2 and can be picked up for next to nothing. Buy Elevator Action Returns on GameGavel or Amazon. Tagged 1997, Action, Arcade, Elevator Action, Returns, Review, Saturn, sega, Taito. Bookmark the permalink.